The 3rd recording by Schäl Sick Brass Band is another carnival of noise from Europe, still strong on the Balkan side, but with other flavors generously added to the mix. Released in 2000 and still as hot now as it was then! "Germany`s best collective bellows" produced with "Maza Meze" another colourful album following up to "Majnoun" (1996) and "Tschupun" (1999) which both won the German Critics Award. Named as a "Carnival of musical styles" by the Süddeutsche Zeitung after their marvellous concert in Munich, wherever the Schäl Sick Brass Band is playing, great fun fills the air. Performer: The Schäl Sick Brass Band. "For our next song, we would now like to play for you ‘Kalina Malina’. It’s about the girl Kalina, who blows her own trumpet excessively. It’s like this: simple lyrics, but complicated music." Raimund Kroboth grins and straightens his crown of black and red material; in this way the Bavarian exile now resident in Cologne easily takes the role of leader of this hodgepodge of musicians standing on the stage. The tuba player, with his grey suit and battered hat, could be the member of a gypsy band; the drummer could provide the backing for a hip jazz trio. A saxophonist looks as though he is from a French backyard brass band, the trombonist represents, with his uniform outfit, a 60s dance band, while the trumpeter is dressed in a robe which is tropical-arab-asiatic in style. A further saxophonist pads out his lanky frame with a Bulgarian jacket. The Balkanisation of the band’s clothing is however extended by the dress of the singer Iwanka Iwanowa. And singer Iwanka beguiles the audience inimitably overdressed in full national costume with stickers on the left sleeve and thick red ribbons in the heavy pigtails. 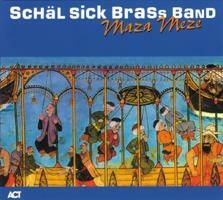 In reality ‘Maza Meze’, the third album by this band from the right bank of the Rhine in the City of Cologne, has a strong Balkan cultural influence. The Schäl Sick Brass Band has created its sound over the past five years by rummaging in the drawer marked ‘World Music’. It has so far released two widely acclaimed albums, and has brought home awards. Its wanderings have taken it from Cologne to Morocco, with stopovers in Hungary and Turkey on the way; and everywhere letting loose storms of satisfaction. Thus Munich’s Süddeutsche Zeitung gave the band the compliment of calling them "Germany’s best collective bellows". But the nature of the band is not particularly German nor does it want to be the best, says bandleader Kroboth. But he’s fine about being called a "collective bellows". Bavarian-bohemian oompah, traditional Greek tunes, New Orleans fonk, Arab melodies as well as pieces from Bulgaria and elsewhere in East Europe, rap, High Life from Ghana, Caribbean and other elements are all on the SSBB menu, brought together by the musical tastes of the members of the manic sound makers and their many guests. Not for nothing is the third album called "Maza Meze", which could be loosely translated as "a selection of starters". On its predecessor "Tschupun", Iwanka Iwanowa appeared on two tracks as guest; this time she has lent her unique voice to six. But even when some of the songs are from the considerable repertoire of the homeland of the dolled-up diva, she gives an additional listenability to the art of the SSBB, by bringing old folklore into new landscapes. Additionally, while the horns let rip on a funk riff, a guitar veers into heavy metal, Ivanka has been able to pick up rapping, the complete antithesis of her guttural Bulgarian vocal technique. She shares the rapping with the German-resident Nigerian Ade Odukaye. What other magic does the SSBB conjure up with its guests? In "Moderne Zeiten", a tune from Charlie Chaplin’s movie "Modern Times" the SSBB mixes the sounds of the roaring Twenties with Zappaesque charm, while on "Bum" Brazilian-style timbalada gallops headlong through the scenery. It’s exactly in keeping with the band’s style: as fast as possible! Pop singer Mohammed Mounir, from Cairo, interprets a Nubian song, which – initially accompanied by crude wind sounds - builds and builds into a wild trance, which is why is it called "Sufi Song". Prudishness gives way to a manic medley on "Reigentanz". And that a Bulgarian polka flirts with Country and Western attitude yet using jazz horns, fits perfectly into the band’s repertoire: everything collected for its own kitchen to create a new dish, with pleasure in music and room for improvisation. Roxana, a guest singer from Teheran/Denmark, sings a Kurdish song to stamping rhythms, frothed up by Mickey Mouse sounds and unruly horns. And when it seems right to commit foul play with German music, then the SSBB guarantees it as an anarchic perverse meaning. Maza Meze, the course of mixed starters, is in fact a tasty meal of many courses. And no need for any tasteless side orders as fillers.